Louis Sockalexis, a member of the Penobscot Indian tribe of Maine, played in only 94 major league games, but is remembered today as the first Native American, and first recognized minority, to perform in the National League. He was signed by the Cleveland Spiders in 1897, fifty years before Jackie Robinson broke baseball's color barrier with the Brooklyn Dodgers. Sockalexis, like Robinson a multi-talented athlete who excelled in football and track as well as baseball, appeared destined for stardom, but alcoholism derailed his promising career. He is, however, at least indirectly responsible for the nickname "Indians" as applied to the present American League team in Cleveland. Louis Francis Sockalexis was born on the Penobscot reservation in Old Town, Maine, on October 24, 1871. He was the son of Francis Sockalexis, a logger who later served as governor (formerly called "chief") of the Penobscot, and the former Frances Sockbeson. Francis Sockalexis was a fine athlete, but Louis, who grew to be nearly six feet tall with straight black hair and a muscular build, was the best athlete in the tribe. Louis won footraces and throwing contests against all challengers, and his natural baseball ability led him to play semipro ball for various teams in Maine during his late teens and early twenties. In 1894, after playing college ball at Ricker Classical Institute in Maine, Louis spent the summer at a seaside resort, patrolling the outfield for a baseball nine sponsored by the Poland Spring Hotel. One of his teammates was Mike (Doc) Powers, a future major-leaguer who, at the time, was the captain of the baseball team at the College of the Holy Cross in Worcester, Massachusetts. Powers was impressed with Sockalexis' talent, and convinced Louis, a Catholic, to enroll at the Jesuit-run institution. This he did in the fall of that year. 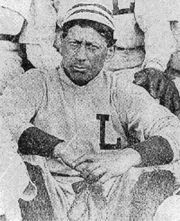 Louis excelled on the diamond at Holy Cross, batting .436 in 1895 and .444 in 1896, and also starred as a running back on the school's first football team in the fall of 1896. He ran track, specializing in the medium and long distances and reportedly winning five events in a single meet. However, it was as a baseball player that he shone most brightly. An incredible throw he made one day from deep center field to the plate was measured by a group of professors at 413 feet, an unofficial national record at the time. He may have been the best college player in the country, and began to draw interest from National League clubs. The Cleveland Spiders had the inside track, as two members of that team, outfielder Jesse Burkett and infielder James (Chippy) McGarr, coached for Holy Cross during the spring months. Louis took hitting tips from Burkett, the two-time NL batting champion, and looked forward to the day when he would compete at baseball's highest level. In December 1896, Sockalexis and Mike Powers left Holy Cross and enrolled at Notre Dame University in South Bend, Indiana. Sockalexis stayed there only a few months — in March of the following year, he was expelled from the college after a drunken row at a local tavern. He then signed a contract with the Spiders and reported to spring practice at an indoor gymnasium in Cleveland on March 19, 1897. Manager Patsy Tebeau was impressed with the Native American ballplayer, and the local sportswriters were so enamored of the exotic newcomer that a headline in the Cleveland Plain Dealer on March 20 referred to the team as "Tebeau's Indians." By the end of the month, the Spiders' moniker was virtually forgotten, and the Cleveland club became the Indians. On March 27, the Plain Dealer stated, "The Indians have a spring schedule which is bound to give them good, hard work." The 25-year-old Sockalexis (who told the club that he was only 23) arrived at practice in top condition. Despite his muscular build, he easily defeated all his new teammates in footraces. Tebeau organized handball contests to keep his players active, and Sockalexis had no trouble winning all his matches. He also displayed his talent at gymnastics. "Sockalexis, who is quite a gymnast, occasionally breaks out with some caper that would tear the ordinary man in two," reported the Plain Dealer on March 26. "Those things are all right in a circus, Louie," said Tebeau, "but you don't need 'em to win ball games." In the March 27 issue of Sporting Life, former New York Giants manager John Ward, who saw the Penobscot star perform at Holy Cross, declared, "I have seen [Sockalexis] play perhaps a dozen games, and I unhesitatingly pronounce him a wonder. Why he has not been snapped up before by some League club looking for a sensational player is beyond my comprehension." "Everybody in Cleveland as well as in other league cities, for that matter, are talking Sockalexis, and if the young Indian isn't the best advertised new man that ever entered the big organization then it will not be the fault of the baseball paragraphers of the press. They have discovered a novelty in it. The newspaper talk concerning the youngster has stirred up great local interest in the Red Man, and of all the young players on the Cleveland Club's list he is the most talked of, and it will be his appearance that will draw the greatest number of curious people at the opening of the season." Sockalexis kept up his fine play during the early months of the 1897 campaign. After twenty games, his average stood at .372, and his presence in the lineup increased attendance both at Cleveland's League Park and on the road. He was a sensation, though many fans bought tickets to jeer at the first Native American ballplayer in major-league history. "Columns of silly poetry are written about him, [and] hideous looking cartoons adorn the sporting pages of nearly every paper," commented Elmer Bates on May 15 in Sporting Life. "He is hooted and bawled at by the thimble-brained brigade on the bleachers. Despite all this handicap the red man has played good, steady ball, and has been a factor in nearly every victory thus far won by Tebeau's team." On May 13, Sockalexis belted a double and a triple off Boston's best pitcher, 30-game winner Kid Nichols, but the Indians lost the game by a 4-1 score. Sockalexis had trouble hitting curveballs from lefthanders, and sometimes found it difficult to judge balls hit directly at him in right field, but Patsy Tebeau expressed confidence that the rookie would correct his weaknesses and become a more complete ballplayer. Perhaps the high point of Sockalexis' season came at the Polo Grounds on June 16, when he faced New York's strikeout champion Amos Rusie. While more than 5,200 fans hooted and made Indian war cries at the Cleveland rookie, Sockalexis walloped a curveball from Rusie over right fielder Mike Tiernan's head. By the time Tiernan could retrieve the ball, Sockalexis had sped around the bases for a home run, his third of the season. He struck out in his next appearance, and misplayed a line drive hit by Tiernan for a three-base error later in the game, but Cleveland coasted to a 7-2 victory. However, Sockalexis had brought a drinking problem with him to the major leagues, and on July 3, disaster struck. He went out on the town in Cleveland that Saturday evening, and drank what onlookers recalled as a prodigious amount of alcohol. Sometime during the wee hours, Sockalexis either jumped or fell out of a second-story window, severely spraining his ankle. He managed to hide the injury from his manager and teammates on Sunday, an off-day for the Indians, but when he showed up at the ballpark in Pittsburgh for a game on Monday, July 5, he was limping noticeably. Patsy Tebeau pulled him from the lineup and sent him back to Cleveland to have his injury treated. A physician put his ankle in a cast and ordered him to bed, but Sockalexis reportedly spent the next several evenings in the local bars while his teammates carried on in Pittsburgh. Sockalexis returned to the lineup on July 8, and although he was still limping, he hit well for the next few days. Unfortunately, he suffered an embarrassing relapse four days later, when the league-leading Boston Beaneaters came to League Park. Sockalexis dropped a fly ball in the first inning, then let Fred Tenney's grounder get through his legs for a three-base error in the fifth. Two batters later, Jimmy Collins swatted a liner to right that Sockalexis did not appear to notice right away. It went for an inside-the-park home run, and the fuming Tebeau yanked the rookie from the game. Sockalexis was most likely intoxicated on the field, and his alcohol problem was now public knowledge, in Cleveland and around the league. Sockalexis was losing his battle with alcoholism, and on July 29, when the Indians departed on a western trip, he did not accompany them. He had been suspended without pay by team owner Frank Robison. "I think I can truthfully say," said the owner in the August 7 issue of The Sporting News, "that I have done everything I could for Sockalexis, and he has repaid me, and the Cleveland club, by the basest ingratitude. I have waited as long as I could, and have given him every chance to do what is right, and only punished him when I felt that I must do so in justice to myself and the rest of the club." Sockalexis expressed remorse for his actions, and although Tebeau left him behind on another road trip in late August, the rookie appeared to be sincere in changing his behavior. He played little in August and September, however, and ended his season with a .338 average and 16 stolen bases in 66 games. Although Sockalexis appeared to stay sober in 1898, he lost his starting position in right field to Harry Blake. He spent most of the season on the bench, appearing in only 21 games and batting .224. Perhaps Patsy Tebeau no longer trusted his formerly prized acquisition, for in 1899, when Frank Robison bought the St. Louis Browns and transferred all the Cleveland stars to the Mound City, Sockalexis was not invited to join them. He remained in Cleveland with what historian Lee Allen, in The National League Story, called "the sorriest shell of a team ever seen," on a roster filled with rejects, prospects, and semipro players. Under the direction of third baseman Lave Cross, this edition of the Cleveland ballclub would win only 20 games that season, compiling the worst single-season record in major-league history. Sockalexis, suffered a spectacular relapse, and became so dissipated that he could not even play for the worst team in the game. Although the Plain Dealer had reported on May 10 that "the big Indian seems to have come to his senses at last, and is doing his best to get back to his old-time form," Sockalexis was in no condition to play. On that same day, in a game against St. Louis, he let several fly balls drop safely in right field, though he was not charged with any errors. At one point, he was standing on third when the batter drilled a clean single to the outfield. Sockalexis made a late start for the plate, and was thrown out easily. The next day, he banged out five hits, but dropped two fly balls and was thrown out at home on a botched double steal. After the game of May 13, in which a drunken Sockalexis fell down twice in the outfield, the club released him from his contract. Despite a career batting average of .313, he never played again in the major leagues. Sockalexis was quickly signed by Billy Barnie, manager of the Hartford club of the Eastern League, but lasted only a few weeks. He then played for Waterbury and Bristol in the Connecticut State League, batting .320 and apparently keeping his drinking under control. However, although the Waterbury club was interested in retaining him for the following season, Sockalexis was nowhere to be found when the spring of 1900 rolled around. A series of news reports during the next two years detailed several arrests for public drunkenness and disturbances, and it appears that the former baseball star was reduced to homelessness and vagrancy. He spent several short terms in jail during this period, and remained out of the game until 1902, when he signed with Lowell of the New England League. Now 30 years old, Sockalexis hit for a credible .288 average, but remained with Lowell for only one season. A short stint with Bangor in the Maine League in 1903 was his last connection with organized baseball. Louis Sockalexis wound up back on the Penobscot reservation in Maine, playing for local town teams and teaching the game to young tribesmen. He piloted a ferryboat between Indian Island, home of the reservation, and the mainland, and enjoyed reading copies of The Sporting News and other papers that his passengers left behind. Although he had apparently stopped drinking to excess, he was not healthy, and caught colds and fevers easily. He also suffered from attacks of rheumatism, and appeared much older than his years. In the fall of 1913, Sockalexis joined a logging crew that harvested trees deep in the Maine woods. While cutting down a massive pine tree on December 24 of that year, he suffered a heart attack and died at the age of 42. He was buried in the cemetery on the Penobscot reservation. Ed McKean, the longtime Cleveland shortstop, paid tribute to his former teammate in an interview with the Cleveland Leader, published on January 4, 1914. "He was a wild bird," said McKean. "He couldn't lose his taste for firewater. His periodical departures became such a habit [that] he finally slipped out of the majors. He had more natural ability than any player I have ever seen, past or present." Cleveland's American League team (which began play in 1900) had been called the Naps in honor of playing manager Napoleon Lajoie, but when Lajoie left the team after the 1914 season, a new nickname was in order. In January 1915, team owner Charles Somers, after consulting with several local sportswriters, decided to revive the name that had defined the city's National League club 18 years before. Somers, perhaps recalling the all-too-brief period of excitement that Louis Sockalexis had brought to Cleveland in 1897, dubbed his team the Indians, a name that remains to this day. Cleveland Plain Dealer, various issues from 1897 to 1899. Cleveland Leader, January 4, 1914. Sporting Life, March 27, 1897; May 15, 1897. The Sporting News, March 20, 1897; March 27, 1897; April 24, 1897; August 7, 1897. Lee Allen, The National League Story (New York: Hill and Wang, 1961). John Phillips, Chief Sockalexis and the 1897 Cleveland Indians (Cabin John, MD: Capital Publishing, 1991).